Flowing more than 340 miles from the mountains of western Virginia to the Chesapeake Bay, the James River is the largest river in the Commonwealth. 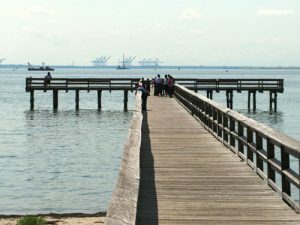 Near Newport News Point, the James River is joined by the Elizabeth River and the Nansemond River. The convergence creates a natural harbor at Hampton Roads Virginia. One of the most popular rivers of the Chesapeake Bay Watershed, the James is frequented by power boaters, rafters, kayakers, fishermen, naturalists, and others. Located along the banks of the tidal James River are the communities of Jamestown, Fort Eustis, Newport News, Norfolk, and Hampton.